Specifically, curl the dumbbells to your shoulders, press both overhead, alternately press each, lower both with a hammer grip, then set them down and perform five push ups. Repeat the cycle 2 more times. Some colleagues and I learned this finisher at an outstanding strength and conditioning clinic at Michigan State University a few years back, and chose to name it “MSU Upper Body Finisher” out of respect. I highly recommend the 3 x 3 workout. Use whichever combination of exercises and reps best suits you, and get after it! In a previous article, I discussed various exercises that should be performed if one wished to develop strength, health, and increased muscle mass. The motivation for writing that article was something I came across on the internet. The "age of information, " in which we live, has given us access to a seemingly unlimited source of training knowledge. Unfortunately, we are also subjected to a large amount of fancy theories, sissy exercises, and "bro science." Any so-called expert who doesn't endorse consistent, progressive hard work on the basic exercises should be ignored. Granted, ignoring useless information is easier said than done. But if you have a realistic goal, a systematic plan, and the desire to put in the required work, then you can successfully navigate through the silliness and become bigger and stronger. Recently, I came across another internet article on a training website. The subject of this one was how to create the perfect home gym. For those who are fortunate enough to be able to train at home, I sincerely hope that your gym is, indeed, "perfect." While most commercial gyms will never be able to satisfy each and every member, a home gym, on the other hand, provides the perfect opportunity to create an optimal training environment. 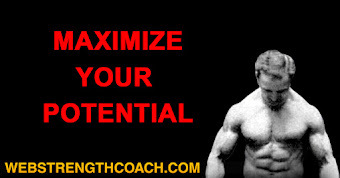 Naturally, you have to know which pieces of equipment you will need to accomplish your goals. And, of course, you have to be able to obtain the items you need, as well as have the available space for everything to fit. I will describe the article, written by a film industry personal trainer, and see how it applies to a hard-training lifter. While we don't normally equate Hollywood trainers with serious lifting, there are many points that were brought up with which I agree. Of course there were others that were complete nonsense. I will try to separate what is good from that which is best left ignored. The first point that was raised is a very valid one: "Do time and budget constraints make it exceedingly difficult to belong to a commercial gym?" Most commercial gyms are, sadly, expensive. Additionally, very few of these gyms cater to serious Lifters. Naturally, paying an arm and a leg for a membership to a place you cannot possibly train properly will make the decision easy. If you are lucky enough to have access to a quality gym, then you are in the minority . Before I get to the equipment that this "trainer" recommends, there is one paragraph in the article that needs to be addressed. Motivation. 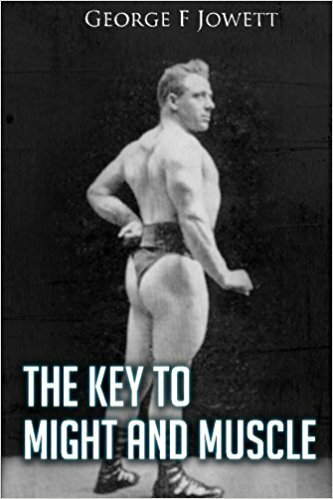 The author argues that some people need to be in a group environment in order to to make gains. Gym Bros, Gym Chat, and other silliness are supposed to be a motivating force. What a bunch of bull! If you are truly dedicated to a goal of Strength and Health, you will not need others to inspire you to train. In fact, you should be able to motivate yourself without the aid if a "trainer," or anyone else. One of the greatest lifters of all-time, John Davis, for many years trained in the basement if a church, by himself. 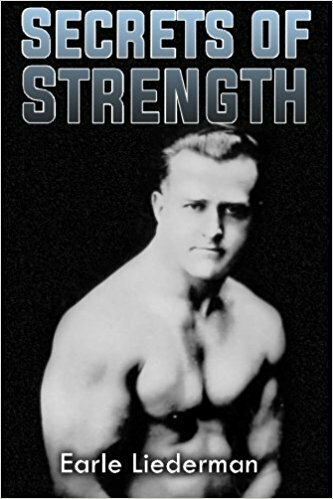 He did not need cheerleaders, "rep counters," or anybody else to become one of greatest Weightlifters who ever lived. Incidentally, I sometimes wonder if most personal trainers today have any knowledge about John Davis, Tommy Kono, or Norbert Schemansky? Barbells and weights. I have always felt that ANY gym should start with a quality barbell. Do not settle for a cheap bar. 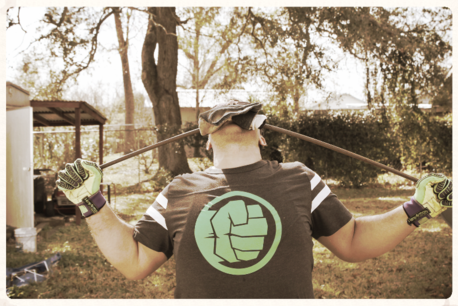 Sure, quality barbells cost more, but isn't it worth it? In lifting, as in life, you get what you pay for. There are many quality barbells available. Don't sacrifice quality just to save money. A good barbell will literally last a lifetime. Bench. A strong, sturdy bench is also crucial. Bench Presses and Incline Presses are important movements. A quality bench is an invaluable addition to any gym. While we're on the subject of Bench Presses, do NOT perform Bench Presses or Incline Presses alone. Always have a spotter on hand. If you do not have a spotter available, then the next item is crucial. Power Rack. The Power Rack has been around for decades. Countless lifters have built tremendous strength with this great piece of equipment. You can do heavy partial movements, as well as Squats and Bench Presses in complete safety. Whether you want to call it a Cage, a Rig, or a Rack, find yourself a heavy-duty power rack. You will never regret the investment. Kettlebells. Here is where I don't completely agree with the author. While I have nothing against kettlebells, per se, I think a set of heavy adjustable Dumbbells are more practical. And just as effective. If you have access to both, then by all means invest in both. On a personal note, I would try Center Mass Bells (CMBs). 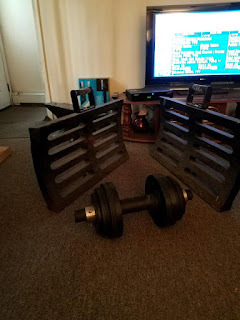 I've purchased a bunch of them over the last few years, and have had great workouts with them. Cardio. The author, surprisingly, does not recommend investing in a treadmill, stationary bike, or other cardio machines. He advocates high-rep bodyweight exercises. 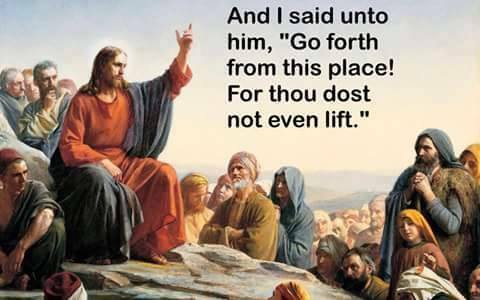 He also recommends "lifting weights fast." Whatever that means. I think everyone should do some form of cardio, particularly if you are over the age of 35. Brisk walking is an easy, low-impact way to get your body moving. Needless to say, you won't need any fancy equipment other than a good pair of walking sneakers. A more intense way of incorporating cardio training into your workouts would be to purchase a good Jump Rope. If your knees and ankles can handle the impact, then skipping rope is an effective way to burn calories. Spin Bikes, Suspension Trainers, Punching Bags. These are other items that the author recommends. I had always thought that most stationary bikes are the same, but, boy, was I ever wrong! Spin classes are extremely popular, and the bikes they use are technically advanced, and capable of simulating myriad workouts. As for punching bags, in the past I've used both Heavy and Speed Bags. 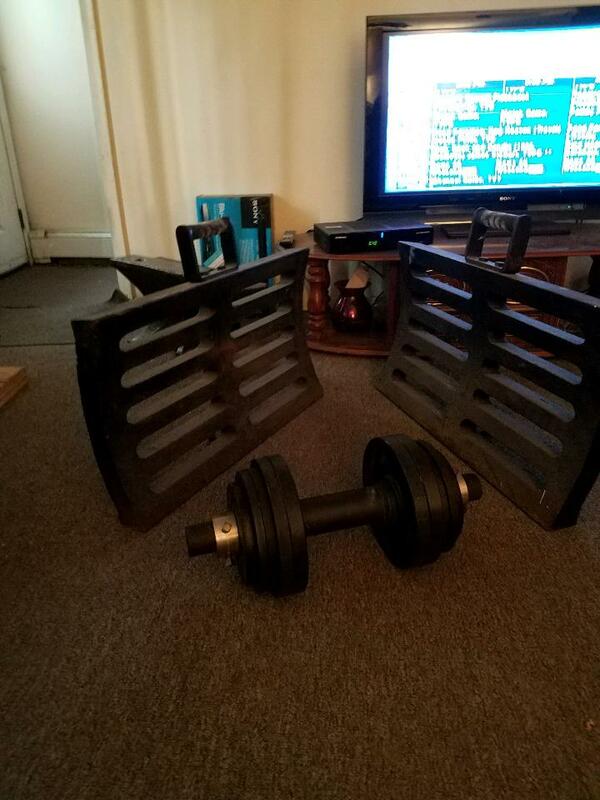 While you may get a nice workout from these pieces of equipment ( as well as burn off a lot of aggression), there a more effective ways to build strength. An additional note regarding the use of Heavy Bags: It would behoove anyone planning on using it to learn the correct way to deliver a punch. Your wrists will thank you! Mirror. While the author is ambivalent about the need for a mirror, I would just like to add what I learned about mirrors from my days at Bruno's Health Club. While they may assist you in developing good form in the Squat, and Deadlift, especially if you're a beginner, they are not necessary. Don't become dependent upon them. Especially if you are a competitive lifter. As Larry Licandro used to say: "There are no mirrors in a contest." In other words, if you are used to Squatting in front of a mirror, then you will be in for a rude awakening when you are Squatting in front of a crowd of people. For those "Garage Gorillas" who are in the process of equipping their gym, best of luck. It goes without saying that you can have the very best if everything, but it won't do a bit of good if you don't use the equipment properly. Training progressively, and safely, with the goal of poundage progression, should be the goal of all people who lift weights. Strength and Health must be earned. These are the first six words of an article by the same name which was originally published in the December 1942 issue of Strength and Health magazine. Over seventy-six years ago, Bob Hoffman offered advice that is as useful and relevant today, as it was back then, during the height of World War Two. While there is no way to accurately determine how many people read the advice offered in the original article, it is interesting to wonder just how many people derived a direct benefit by following the numerous axioms of that time. 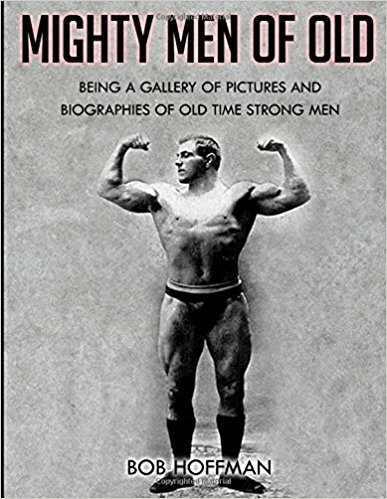 Hopefully, there were a great many Physical Culture devotees who lived long, healthy , and strong lives by heeding the advice of the "Father of World Weightlifting." In this article, I will mention a few of the more notable nuggets of information. "The state of strength and health we enjoy depends upon the lives we lead." Obviously, you cannot get stronger without lifting weights. But just going to the gym is not enough. You have to train the right way. By that I mean consistently and progressively. Hard and heavy. Whichever words you want to use to describe it, you cannot simply buy a membership to a gym and expect to make progress. This point is especially pertinent to the many New Year Resolutioners who annually invade gyms and Health clubs at this time of year. You cannot sleepwalk through a workout, and expect to get stronger. You must have a goal, and a plan to achieve that goal. Then you must dedicate yourself to achieving that goal. "A large percentage of the population go through life offering themselves excuses why they don't exercise." I suppose laziness, insofar as it relates to working out, has been around since time immemorial. Certainly, for as long as people have been lifting weights, there has always been the constant struggle against becoming lazy and complacent. We've all had to fight the temptation to skip a workout when we didn't feel like lifting. But, if you really want something, you will find a way to get it done. We all have time- 1,440 minutes in each day. How we use those 1,440 minutes will determine if we earn our Strength and Health. "Proper exercise is the difference between strong, healthy, energetic supermen, and the sadly out-of-condition people we see everywhere." The more you put into your workouts, the more you will get out of it. Regular workouts are a long-term investment that you can make for the future. Even moderate lifting will pay you a thousand times in dividends of physical benefits. 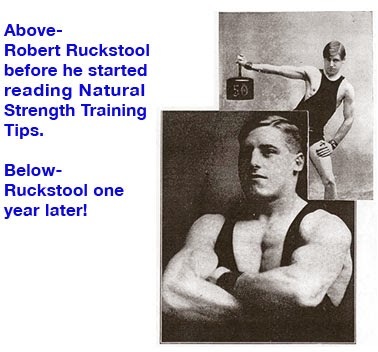 Certainly, during the 1940s, weight training was not as accepted as it is today. 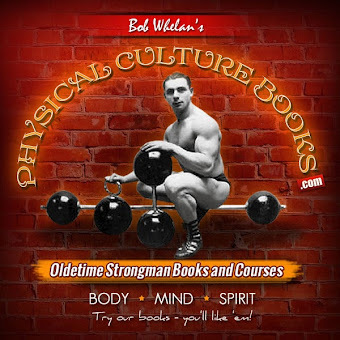 Nevertheless, many people still embraced the idea of progressive resistance training ( no doubt because of the gospel put forth by people like Bob Hoffman, and John Grimek) and developed their bodies. Today there is no reason why anyone cannot achieve some sort of physical condition. Numerous gyms, exercise equipment and training information exist today that simply weren't available during the "war years." "Activity is life. Stagnation is death." 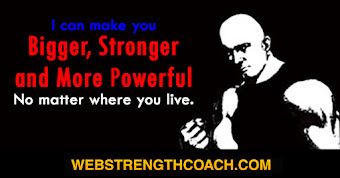 Sensible strength training brings healthful activity to every organ, gland, and cell in the body. While Bob Hoffman could not have possibly foreseen the sedentary lifestyles that would characterize our present-day culture, he did warn against slipping through life doing nothing constructive or beneficial for our bodies. "Weightlifting and weight training is a pleasure." Truer words were never spoken. Lifting weights is indeed a pleasure. The ability to push yourself, and push yourself through a challenging workout is something to be celebrated. You should look upon your workouts as a pleasure. Not something to be endured, but rather something to look forward to with anticipation. The anticipation of being able to challenge yourself. Those of us who are fortunate enough to be able to train should never take this for granted. Lifting weights and working out can - and should- become more than a mere hobby. It is a way of life that will improve your life, and add to it in ways that cannot be described in an article. While some train for the goal of entering competition, such as Weightlifting, Powerlifting, Strongman, or bodybuilding, the vast majority of trainees lift for the sheer love of training. Even if you do compete, your toughest opponent will always be yourself. All people who strength-train are, in fact, engaging in competition. Your opponent is your potential. While the world has changed a lot since 1942, people, for the most part, have not. And words of wisdom that resonated nearly eighty years ago ring just as true today. This is the time of year when just about everybody has some sort of physical goal set for themselves. As the weeks, and months, go by, time will determine just how many people are truly serious about achieving their goals. How many of us will earn our Strength and Health in 2019? Editors Note: Great article Jim!